This professional Tanoura dancer has a Guinness World Record for her Whirling Dervish skills and she is also one of London's most sought after Bellydancers. 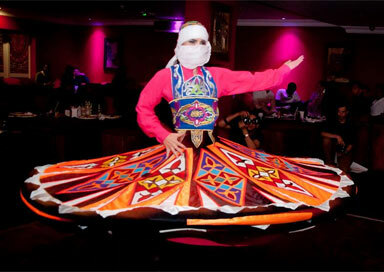 This professional Tanoura dancer even has a Guinness World Record for her Whirling Dervish skills! Based in London but happy to travel she is also one of London's most sought after Bellydancers. 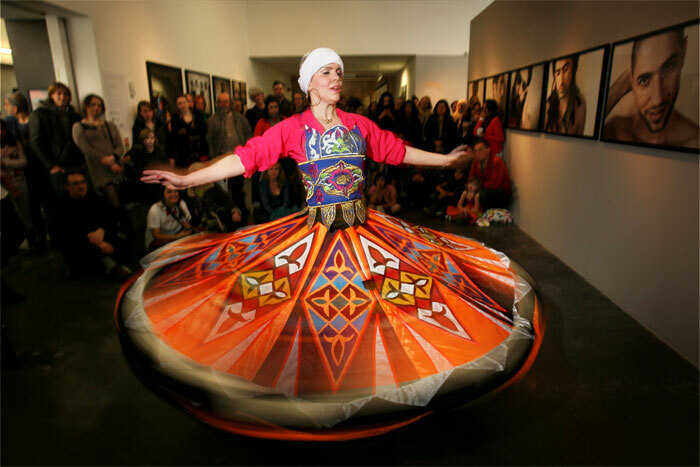 She performs Arabic folk dance as well as the Whirling Dervish. View her Belly Dance profile here and she can be booked for a mix of both styles of dance. She performs both modern and traditional belly dance styles as well as Arabic folk dances, Egyptian Tanoura dance and Sufi Whirling Dervish Style. She is a true international dance artist and has worked on high profile contracts in Egypt, Abu Dhabi, Lebanon, Palestine and Oman and has performed in Spain, Austria, France, Germany, Gambia and Japan. She has held long term dance contracts in both Cairo and Sharm El Sheik gaining over 9 months stage experience working in famous theatres like the Theatre of Art in Downtown Cairo, and working for the famous Roman Theatre in Sharm. Whilst in Egypt she worked and trained intensively with some of the most famous choreographers and directors in Egypt. Other experiences in Egypt include working for Egyptian film and television (channels 1 and 3) as well as performing for The Sultan of Oman in the Sinai desert. In 2010 she held a 2 week contract at the exclusive nightclub Al Mandaloun in Beirut, and was flown out for New Year at the Sheraton Zenith Nightclub in Abu Dhabi. In 2009 she performed in Palestine where she held a weeks residency for Eid celebrations at the Murad Resort in Bethlehem. She also performed for the Golden Tulip Seeb Hotel for News Years in Muscat, Oman for both 2012 and 2013 New Years Parties and has held a contract for the Al Khaleej Palace Dubai. Outside of the Arab world she has performed in Japan, Germany, Gambia, France, Spain, Austria, and The British Virgin Islands and danced for 2 years in Japan working in some of Tokyo's most well known Arabic venues and for many corporate events. Based in London, she dances almost every night working at high profile events and venues. She has worked at over 40 of London’s Middle Eastern restaurants and venues, she has worked at casinos such as Rendezvous, The Mint Club, Crockfords, Palm Tree and The Groversnor, as well as five star hotels such as Claridges, Dorchester and Mandarin Oriental.